The Medi UK Mediven Elegance Thigh Class 2 Beige Compression Stockings with Top Band are compression stockings from Medi, one of the UK's leading compression stockings manufacturers. They're designed to be as fashionable as possible while still delivering the compression you need. They give a moderate compression of 23 - 32 mmHg. They also feature a double heel reinforcement, which makes the Medi UK Mediven Elegance Thigh Class 2 Beige Compression Stockings with Top Band even more comfortable. The Medi UK Mediven Elegance Thigh Class 2 Beige Compression Stockings with Top Band features Clima Comfort, which reduces sweaty feet and stops skin from drying out. Clima Fresh keeps the stockings fresh and hygienic by preventing fungus & bacteria from sticking around. The new soft elastic knitting technique helps increase your comfort by allowing your toes to feel free and reducing pressure on the forefoot. They're completely inconspicuous in shoes, and are dermatologically tested and latex free to ensure they're as skin-friendly as possible. Be sure to consult with a doctor to be sure that this product is right for you. Medi assumes no liability as a result of any contraindicated use of this product. For information on sizing your compression hosiery, please see the "Sizing" tab above. Medi Mediven Elegance Class 2 Beige Thigh Compression Stockings with Top Band are non-returnable and non-refundable on grounds of hygiene. Please be aware that the staff at Compression Stockings are not medically trained and cannot advise you on whether or not stockings are suitable for you without information from a trained professional. Please use the Contraindications tab to further assess your suitability for Mediven Elegance products. 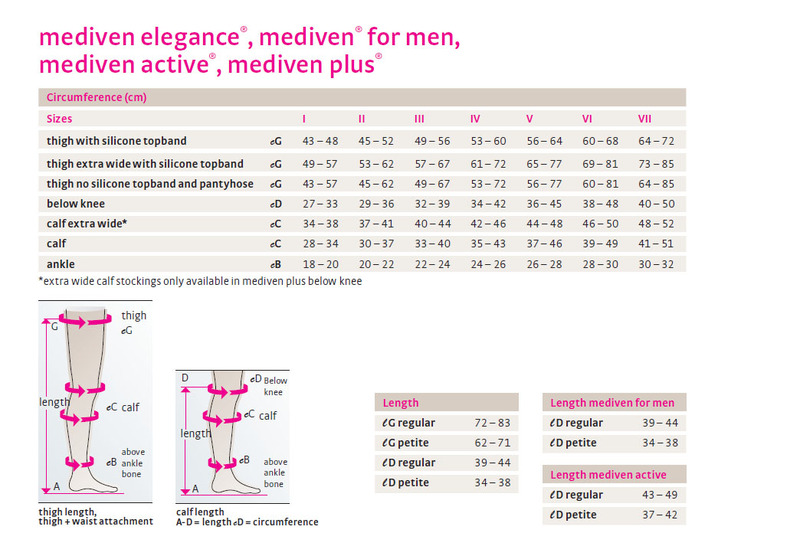 Mediven Elegance Compression Garments should not be used with the certain conditions, please see the information below to further decide suitability. We strongly urge anyone uncertain of their suitability for these stockings to check with a medical professional before purchasing. Please use the straightforward chart below to find which size of stockings is right for you.